Brought to Batesburg-Leesville as a toddler, Cal was quickly shaped by his surroundings and adopted the fighting spirit of the Batesburg-Leesville and Saluda communities. He was taught from a young age that the American Dream is achievable for anyone with a little hard work and elbow grease. His parents and neighbors showed him the value in a hard day’s work, instilled in him a blue collar resolve, and taught him to get up when he got knocked down. 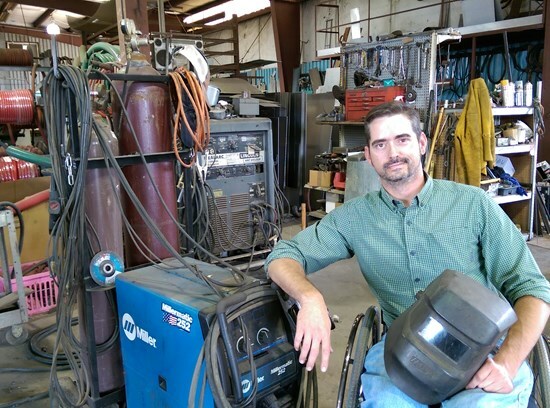 Never afraid of manual labor, Cal returned home from Clemson in 1998 and began working as a welder. Sadly, at the age of 24, Cal suffered a traumatic injury that left him paralyzed. Those days remain some of the darkest of Cal’s life but his faith in God and support from many allowed Cal to overcome the physical limitations and emotional scars left that day. That accident taught Cal about the fragility of our existence, the precious gift of life, the resolve of the human spirit, and the necessity to live without regret – to give everything in all we do, to speak with sincerity in our hearts, and to live for the betterment of the people around us. It is through this event that Cal views our small corner of the state and it is with that determination that he’ll fight for us in Columbia. Cal has spent his adult life championing our conservative causes. As a small business owner and advocate for the 2nd Amendment, Cal has long fought against unnecessary government regulations and its constant meddling in our everyday lives. But now, as our politicians put special interests first, wastefully spend our tax dollars, and fail to respond to us, Cal is worried that we are not receiving the representation we need. That’s why he has offered himself as a candidate for the South Carolina House of Representatives – to promote job creation policies, improve our crumbling roads, reform education, lessen the tax burden on South Carolinians, eliminate wasteful spending, and provide us the representation we deserve.